Boston, MA USA (October 15, 2018) — 2getheraudio™, (https://www.2getheraudio.com/), announced today the immediate availability of two new expansion packs for the company’s RE4ORM virtual instrument. 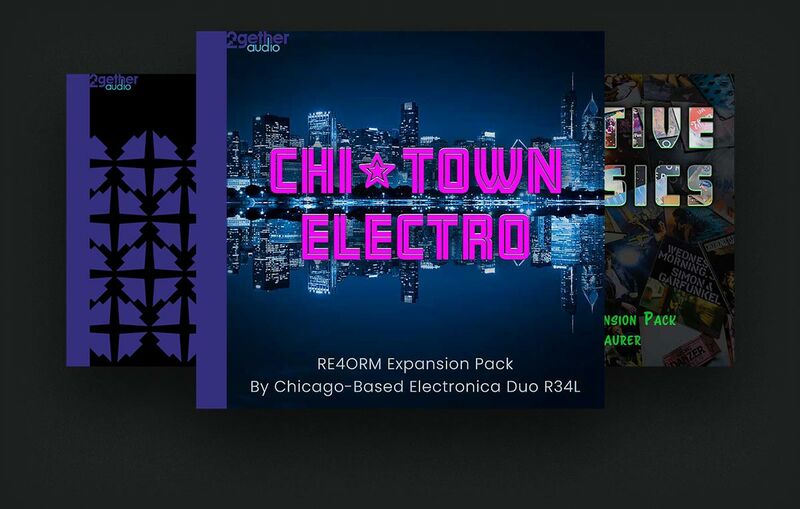 Chi-town Electro is a set of new sounds straight out of the windy city of Chicago from featured electronica artists R34L. Featuring just over 75 presets in 8 categories (Basses, Leads, Pads, Plucks, Rhythmic, Soft Leads, Effects and Textures), Chi-town Electro gives artists a set of pre-produced sounds ready to go in EDM, Hip Hop or other music tracks. As a bonus, two Ableton Live 10 project files produced by R34L are included and feature sounds from the expansion pack. 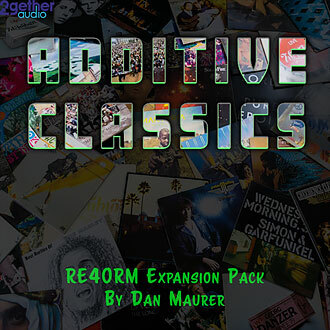 The second expansion pack features over 170 classic Basses, EFX, Keys, Leads, Motion, Pads, Plucked and Strings/Brass instruments produced by expert sound designer Dan Maurer. An expert in additive synthesis (and a long time neighbor of Bob Moog), Dan treats us with more traditional sounds to augment the soundscape and electronic timbres found in the factory set and Chi-town Electro sets. In RE4ORM, users can draw and warp the shape of both the additive synth waveform and a multi-filter modulation LFO called the Free4orm Filter. The Free4orm LFO is a much more creative way to add automation to your plugins. Even better, the factory included Free4orm shapes such as Fractals, Skyline, Crystals and Pulses are all synchronized to the DAW tempo with user selectable speeds leading to experimentation and sonic results you just can’t get any other way. Of course, users can create and save their own Free4orm shapes leading to endless possibilities for custom sound design. RE4ORM utilizes the Qubiq Audio struQture™ (http://www.qubiqaudio.com/struqture) audio engine, a software platform that builds virtual instruments and effects plugins and features a fully modular architecture for combining multiple synthesis methods (sample playback, virtual analog, FM, additive and others), modulators, effects and players like arpeggiators. The struQture audio engine is used in plugins from Akai Professional, NOS Audio, Sonivox and others and is built and maintained by 2getheraudio engineers.